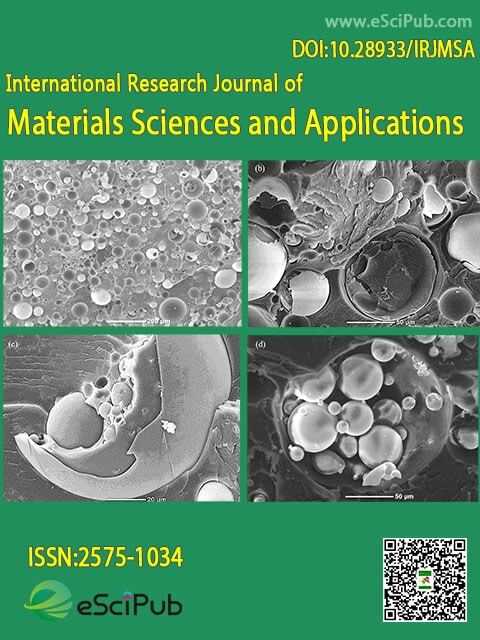 International Research Journal of Materials Sciences and Applications (ISSN:2575-1034) is a peer reviewed open access journal publishing articles in materials sciences and applications. Characterization and Cu(II) adsorption properties of activated carbons prepared from cotton stalk by one-step H3PO4 activation. Research Scientist, Ulsan National Institute of Science and Technology (UNIST), UNIST-gil 50, Ulsan 44919, South Korea. Senior Engineer, Core Innovation, Sealed Air Corporation, USA. International Research Journal of Materials Sciences and Applications (ISSN:2575-1034;doi:10.28933/irjmsa) is a peer reviewed open access journal publishing research manuscripts, review articles, editorials, letters to the editor in Materials Sciences and Applications. Please submit your manuscript by the form below or send it to submit_manuscript@escipub.com (use International Journal of Materials Sciences and Applications as the email subject line).